An early start today after an uncomfortable night in the car! I drove along the coast and parked above Portscatho and with my handy gas stove, made a mug of tea and a bacon roll, enjoying the early morning sun coming up which looked promising for the day ahead. Feeling refreshed, I started walking along the coast path and around Nare Head, ending up at Porthloe by 8.30. This was another little cove that I didn’t know but looked very pretty with boats arriving back in from fishing trips and a nice looking hotel on the slipway. I decided I should head back to the car and find a campsite before I do anything else. 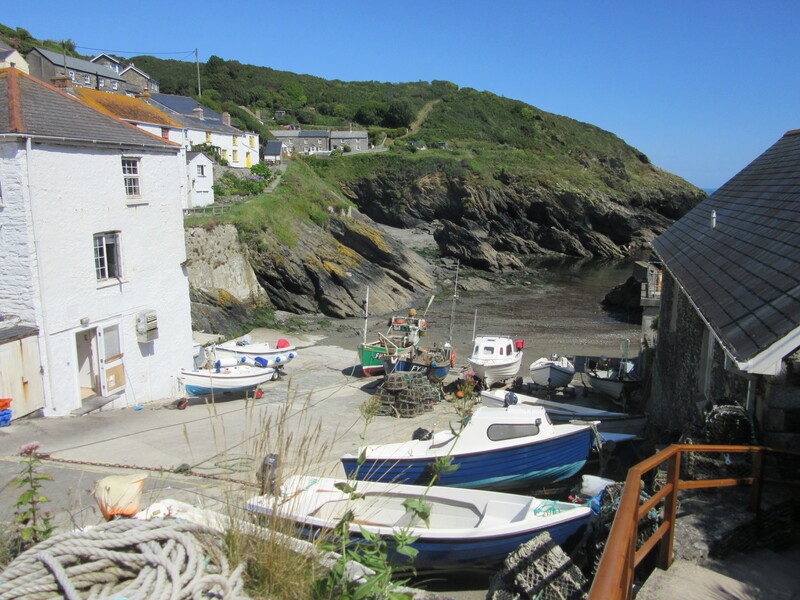 My guide book recommended an place at Gorran Haven which was a few miles along the coast which sounded ideal at £10 p.n. and 1km from the coast path. I tried to follow the lanes but the place names on the road signs didn’t match the names on my AA road map so I ended up going to St. Austell and towards Mevagissy when I found a sign for Gorran Haven. I arrived at Trelispen camping and caravan site as many were packing up after the weekend but there was plenty of space here and it looked quite clean and tidy. Dr. James Whetter is the owner who came over and welcomed me to the site and told it was £12 p.n. I didn’t question the price as the extra could be because I have a car as well. I was just pleased to find somewhere easily and wouldn’t have to spend another night in the car. I paid for two nights. As I said the site is tidy, has good level ground (a real bonus after my recent camping experiences where I have ended up on a slope and wake up finding myself huddled at one end of the tent! ), toilets, showers, washing up area, washing machine and fridge freezer James was interested to know I was walking the SWCP and asked where I was heading. When I told him I had been to Portloe, he said I could walk there and back quite easily from here heading along the road to cut of the headland and joining the path at Hemmick. Once I had pitched the tent and unpacked a few things, I filled my water bottles, put some snacks into my rucksack and headed off for a long day’s walking. It was around 30 minutes before I found the coast path down at Hemmick Beach and it was getting very hot. There were a few people here enjoying the water with the sea looking very blue today. The path skirted around some fields and through woodland before arriving at the beautiful Porthluney Cove with the impressive backdrop of Caerhayes Castle. There were lots of families arriving for the day and with parking for £3.50 for the day, this seems very reasonable for such a lovely spot. There are refreshments and toilets here at the top of the clean, sandy beach. The path follows the road up the hill for around a 100 yards due to cliff erosion then turns left into a field and follows the clifftops for a while. Take great care to watch out for marker signs as there are another couple of points where the path has been moved due to cliff erosion. The next village was Portholland (still part of the Caerhayes Estate) where there are more facilities. I kept going as I wanted to reach my destination of Portloe which I did at around 2pm. The tide was out now so I could sit at the bottom of the slipway and enjoy my self – heating meal. A clever invention where you open up the bag which has an inner sachet containing the meal. You just need some water (from a stream or even a muddy puddle!) to activate the self heating system. The water will heating in a few seconds then boil away for around ten minutes when the food is ready to eat. The food in this meal contained sausages, bacon, omelette and beans. The kit even includes cutlery, salt, pepper and napkin. A couple sat nearby were fascinated by it all. A dog was also attracted by the smell and came to investigate! It had taken me three hours to get here so would be at least four heading back I think. I walked back up the steep path out of the cove and along the cliffs. I met a family coming towards me who were in need of some refreshment and were pleased to know it was only another 10 minute walk. I myself was in need of some cool refreshment in the heat and when I arrived back at Portholland, went into ‘Pebbles’ craft shop and cafe to see what was available. The ice lollies had sold out but they had raspberry ripple tubs for just 50p and an ice cold orange Tango for £1. I sat on the picnic bench and enjoyed these and watching all of the water activities. I spotted a few more walkers around here including one older gentleman wearing a suit who looked a bit uncomfortable in the hot weather. There was also a couple with their son all carrying plenty on their backs. I decided it was time to carry on walking back across the fields and woodland to Porthluney Cove where people were beginning to head off after their day out. Over the hill and down to Hemmick Beach, I continued onto Dodman Point which has some great views up and down the coast and where on the headland is a giant granite cross, built by the vicar of Caerhayes as a navigational aid in 1896. The path continues around ‘The Dodman’ above some sandy beaches before arriving in Gorran Haven. This was yet another very busy harbour village with plenty of places to eat, drink or just relax and watch boats coming and going. It was a long, steep walk up the road from here to the campsite and I was pleased to get to my tent, make a mug of tea and just sit down and relax before having a shower and cooking myself some food. James called across to see how I had got on and was impressed that I had also walked ‘Dodman Point’ on my return. Just before I turned in for the night, a couple of walkers arrived to book in for the night. Catherine and Shaun were walking the SWCP for a few days and each carrying a small tent and camping when they felt they had walked far enough. Today’s Fitbit stats: 39,888 steps. 17.8 miles. 5612 cals burned. 290 ‘floors’ climbed.